Syriza's leader Alexis Tsipras waves at his supporters after the results of the European elections, outside the Athens University, on May 25, 2014. 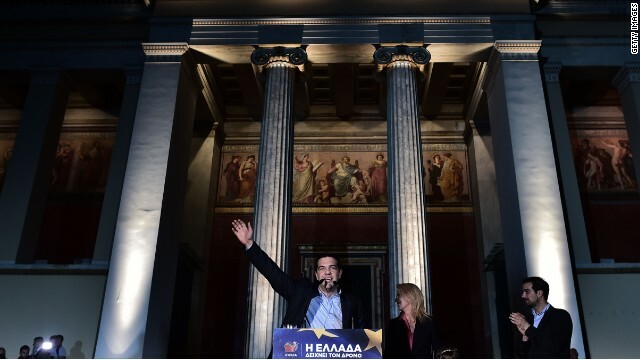 London (CNN) -- Greece's left-wing party Syriza bucked the lurch right in Europe's elections, beating the country's two political mainstays into first place. The party posted an estimated 27% of the vote, four points clear of the center-right's New Democracy, which is headed by Greek Prime Minister Antonis Samaras. 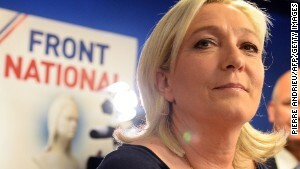 The results were in sharp contrast to the dramatic rise of Marine Le Pen's National Front in France and UKIP in the United Kingdom, both far-right nationalist parties. Syriza received almost three times the votes polled by Greece's far-right Golden Dawn party, which gained nearly 10% and two parliamentarians despite its leaders facing charges of running a criminal organization. Syriza's leader Alexis Tsipras said in a press conference Europe had taken "an important step for the end of the disastrous policies of austerity and the return of democracy. The people of Europe [have] condemned the policies of austerity." Tsipras, who dominated the left-wing stage during Greece's national elections in 2012, said the results were "historic," and revealed a firm rejection of Europe's austerity measures. "The message is that the disastrous policy of austerity must be terminated. All European nations must invest in democracy, growth, social cohesion and solidarity," he said. In a statement, Syriza said the European election results showed the government no longer had "moral and political legitimacy" to negotiate with Europe and that the party would seek a snap election. Syriza's rise comes as Greece struggles to drag itself out of six years of grinding recession, amid austerity measures demanded in return for the country's 240 billion euros worth of bailouts. Syriza stormed into the national political stage when it took 27% of the vote in 2012's national elections, coming second to New Democracy. After increasing its support six-fold in three years and beating Pasok to second place, Syriza had become the country's dominant left-wing force. However New Democracy partnered with Pasok, the historically entrenched party of the center-left, to form a government while Syriza remained in opposition. Syriza's support in the national elections was attributed to a fury at austerity measures and its appeal to youth voting for the first time. Tsipras himself is seen as a smart political operator, ambitious and ruthless. Tsipras, 39, was born the year Greece's military dictatorship fell, and represented a Greek youth unfettered by history, according to supporters at the time. In an interview at the time with CNN after the national elections, Tsipras said he would tear up the austerity plans because he believed it was sending the country to "hell." A trained civil engineer, who joined the Communist Youth of Greece as a high school student, Tsipras shot to prominence in 2006. After being put forward as a candidate for the mayor of Athens, he swept 10% of the vote to come third -- far more than previous left-wing candidates had managed. READ MORE: How do European elections work?